Apple’s second 20 MW solar panel farm, which is about 15 miles away from the data center near the town of Conover, North Carolina, is also up and running. All told, the three facilities are creating 50 MW of power, which is about 10 MW more than what Apple’s data center uses. Because of state laws, the energy is being pumped into the power grid, and Apple then uses the energy it needs from the grid. But this setup also means Apple doesn’t need large batteries, or other forms of energy storage, to keep the power going when the sun goes down and its solar panels stop producing electricity. The solar farms use high-efficiency panels, and one of Apple's farms contains 50,000 panels in 100 acres. These panels also follow the sun throughout the day to ensure maximum energy absorption. The fuel cell farm is smaller, and uses methane biogas to produce its energy. Apple decided to build its own solar power because back in 2010 and 2011, they couldn't buy clean power from the local utility, Duke Energy. They still can't though Duke has taken steps to gain regulator approval to use clean energy sources to provide power. They've been very secretive about this project, and are taking what they've learned from it into similar future endeavors. Apple is currently building another solar farm like the North Carolina facilities near their Reno data center. It also seems likely that Apple's foray into clean power lit a fire under Duke Energy. Since clean energy wasn't available from Duke when Apple was making their decisions a few years ago, they had to go their own way. Duke undoubtedly sees an opportunity to provide power to, and thus make a lot of money from, large internet companies like Google and Facebook, both of which have data centers in North Carolina. 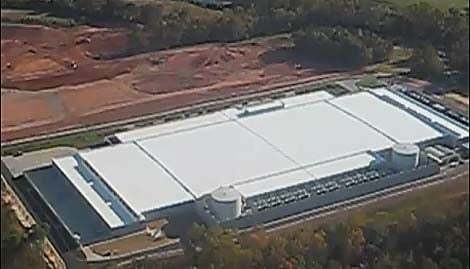 It's likely that they view Apple's data center as a missed opportunity. Google recently announced that they'll be working with Duke on the energy company's clean energy pilot program. How do you feel about Apple's green energy projects? Would you like to see them do more? Sound off in the comments.